I had waited thirteen years to see a World Series game, not to mention a championship clinching win. Just so you can understand where I’m coming from, I’ll explain a bit of personal history; despite my intense fandom, I never had the opportunity to see the Fall Classic in person until this year. In 1996, somehow my father came up with two tickets to Game 6 of the World Series. At the time I was 15, my brother was 10, and we all but did a jig in the living room to be able to go to the game. There was just one problem: there were only two tickets and we didn’t drive, which meant only one of us could go. Only one of us could go? Now we were enemies. We paced the room sweating feverishly, wondering who was going to get to go and who would sit at home. As it turns out my father came up with an idea- he would drop both of us off at Yankee Stadium so we could both be there, and he would pick us up after. Sounds like it would be a splendid idea right? Apparently not if you are my mother. She saw it as a terrible idea for two kids to be left alone in the Bronx and needless to say we weren’t allowed to go: not even one of us. For my mother it has been the longest thirteen years of me constantly reminding her what a terrible choice she made and how we had been scarred for life from the trauma of sitting home alone (we were apparently old enough to be alone in the house, just not in the Bronx) watching Charlie Hayes catch that last out in foul territory, screaming with joy jumping up and down. For thirteen years we had wondered what it must have been like to see your team win the World Series in person. Fast forward to present day, and the wait was well worth it for me. I got to see every postseason home game, including a walk-off ALDS win where Teixeira hit a bullet of a home run to win the game in extra innings. The season ended Wednesday with a Game 6 win for the Yankees (clinching the World Series), and possible forgiveness for mom because my brother and I were there. Finally. As a season ticket holder I was given the option to buy my seats for all postseason home games, and you know I was not going to miss out on the opportunity. This was a great season for the Yankees on so many levels, starting with the signing of Sabathia, Burnett, and Teixeira in the offseason. Then we got to see Mariano get his 500th save (even if it was on the road), and Jeter passed Gehrig for all-time hits leader as a Yankee (not to mention all the walk off wins this team put together). I definitely picked a great year to have season tickets, and see so much history happen. Much of it happened in the rain by the way, whether it was World Series wins or the delay before Jeter’s record breaking hit. 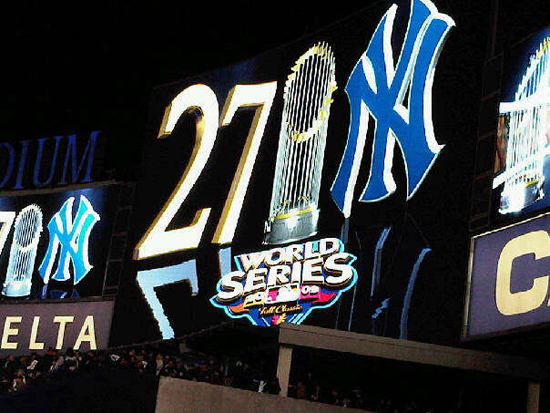 The postseason was my first as a season ticket holder where the Yankees made it to the World Series, making it both the most fun for me and also confirming that I am not a jinx. Most of the games were played in pretty intense cold with rain, while others were just frigid. What does one wear to a baseball game in 40 degree rain you might wonder? The answer is simple: everything. I am oddly superstitious and I will tell you I have been washing and wearing the same clothes the entire postseason. My typical ensemble to the games has consisted of the following: Under Armor cold gear turtleneck and pants, heavy socks, a long sleeve t-shirt, Jeter or Rizzuto t-shirt (only those two), on-field fleece, 2009 postseason sweatshirt, Yankees coat, Under Amour head sock, and finally a Yankees hat. Phew. Oh, and hand and toe warmers, can’t forget those, they were clutch. Despite the cold weather, the feeling of being there for all of these games (especially the World Series clincher) is completely indescribable and amazing. As a fan, watching from home or a bar is great but being there was on a level I had never even imagined. For most of the last three innings of Game 6 I was jumping up and down and shaking my brother, telling him we finally got to be here for this moment . . . of course, he kept telling me to shut up until it actually happened. I was excited the entire day leading up to the game and the whole night after it. The group of people I sit with, a.k.a. the Bleacher Creatures, are the greatest group to sit with and watch a game. We all know each other, and we have all been there through the season, cheering and anxiously waiting for the postseason to finally arrive. It really is something to be there to begin with, but to sit with the same group of people, the friends that you have made over the seasons, is just awesome. 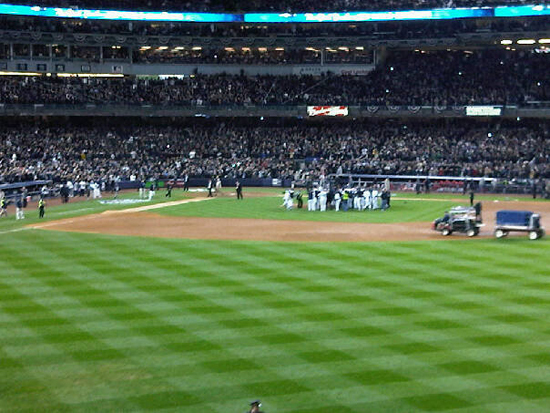 When Cano threw the ground out from Shane Victorino to Mark Teixeira to end the game, clinch the Championship and end the season, my brother and I jumped up and hugged each other. Everyone around us was doing the same, like we all had won the game, too. It was everything I thought it would be when I was 15, but even better. Now that the celebration is over, is anyone wondering how all those bundled clothes worked out for me? Not too well considering I am sick and have been for a while now. Am I upset about it? Absolutely not! 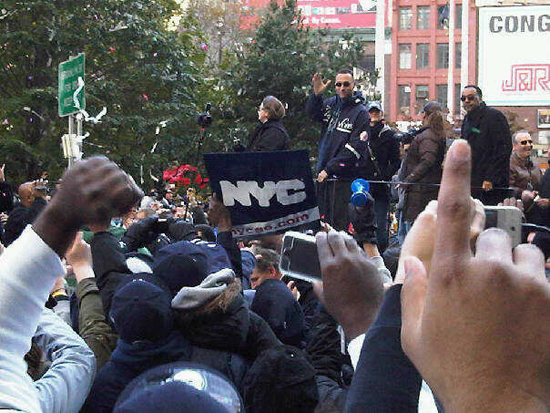 I am lying in bed telling you my story while wearing my World Championship t-shirt and Yankees Championship parade hoodie. My friend Suzy and I got up and going very early to be at the parade down the Canyon of Heroes in New York City: that was the final event to cap off the season and my dealing with cold weather. 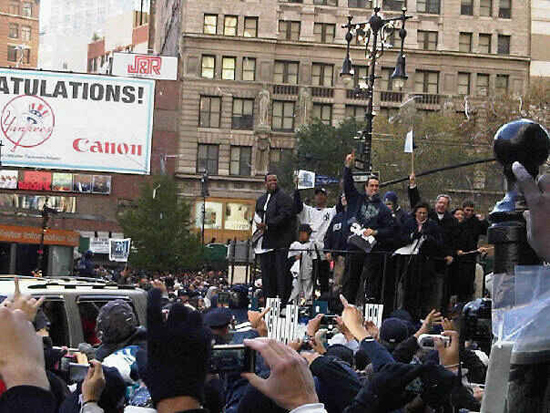 I had never experienced the ticker tape parade before so I had to get there and enjoy it even if it meant getting up at the ungodly hour of 6am. Despite the fact that most of us have not seen much of our beds, or families in the last week it was all worth it. The offseason is here and it may be as much of a welcoming feeling for the fans as it is for the players (or I could just be okay with it now since the Yankees won the World Series). In either case, pitchers and catchers report in roughly 90 days and I will be rested and ready to cheer for my team on Opening Day. Marie co-writes the blog A Cardboard Problem in addition to being a season ticket holder for the Yankees and an all around baseball fan. Marie is an avid card collector and welcomes comments, questions, and e-mails.